Hughes Tool Company, Houston Texas 1939 Executive Offices’ Desk and Chair 1939 Hughes Tool Company, Houston Texas. Howard Hughes Desk Was Manufactured By Doten – Dunton Desk Company Of Cambridge, Massachusetts. The Name Is Synonymous With Fine Commercial Furniture. Hughes Tool Company and Principals Brief Background : Howard Robard Hughes, Jr. (December 24, 1905 April 5, 1976) was an American business magnate, investor, aviator, aerospace engineer, film maker, hotel and casino business owner and philanthropist. He was one of the wealthiest people in the world. As a maverick film producer, Hughes gained prominence in Hollywood from the late 1920s, making big-budget and often controversial films like The Racket (1928), Hell’s Angels (1930), Scarface (1932), and The Outlaw (1943). Hughes was one of the most influential aviators in history: he set multiple world air speed records, built the Hughes H-1 Racer and H-4 “Hercules” (better known to history as the “Spruce Goose” aircraft), and acquired and expanded Trans World Airlines, which later merged with American Airlines. Hughes is also remembered for his eccentric behavior and reclusive lifestyle in later life, caused in part by a worsening obsessivecompulsive disorder and chronic pain. His legacy is maintained through the Howard Hughes Medical Institute. Noah Dietrich (February 28, 1889 February 15, 1982) was an American business executive, who acted as Chief Executive Officer of the Howard Hughes empire from 1925 until 1957, when, according to his own memoir, he left the Hughes operation over a dispute involving putting more of his income on a capital gains basis. The manuscript of his eventual memoir, Howard: The Amazing Mr. Hughes, may have been a key, if inadvertent, source of novelist Clifford Irving’s infamous fake autobiography of Hughes. In 1925, at the age of 36, Dietrich met 19-year-old Hughes, who had just wrested majority ownership of Hughes Tool Company from other family heirs. Started by his father, Howard R. Hughes Tool Company or Toolco, as it was known inside the Hughes empire manufactured oil drilling equipment, especially the multiple-edge, revolving-teeth roller cutter drill bits the elder Hughes invented. Dietrich began by running the tool company for Hughes, allowing him to pursue his interests in the film and aircraft businesses. In his memoir, Dietrich observed that Hughes had little interest in Toolco beyond its being a source of wealth and investment. “The tool company, ” he quoted Hughes as saying, was my father’s success. And it always will be. The huge main plant for Hughes Tool located in Houston, Texas, fronting Harrisburg Blvd. Had grown to be one of the biggest oil tool manufacturers in the World. It had the latest, largest, and most automated equipment for foundries, forging, heat treating, and machining anywhere. At its peak during the Texas Oil Boom, it was a center for manufacturing, design, research, metallurgy, and engineering for oil field technologies. This included tool bits and tool joints critical for oil drilling, some of the first technologies for ram blast bits for drilling in mines, geothermal drilling, and a hydraulic jackhammer known as the Hughes Impactor. It even had a fully functioning oil drilling rig inside its main research lab where any kind of rock bit could be tested on any kind of rock, up to and including granite. This became the “new” Hughes Tool Company while the remaining divisions of the business were placed in a new holding company, the Summa Corporation. Hughes Tool Company Desk and Chair : The Hughes Tool Company Desk and Chair were removed from the Executive Offices of the Hughes Tool Company many years ago, during the company’s first of many remodeling projects. They were carefully wrapped for protection and stored in an airport storage hanger in a suburb of Houston, Texas. 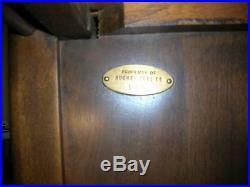 A brass plate located on the left inside panel on the desk authenticates the desk as “Property of Hughes Tool Company 1939″. No such identifying plate is present on the chair. The desk and its accompanying chair were discovered in storage several years ago. The desk was put in storage for later intended use. 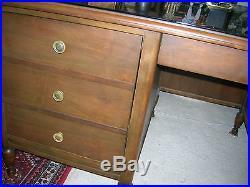 The desk and chair needed only very minor touch up work from a professional furniture refinisher. The chair has a leather upper, front and back, with brass rivot and a woven stain and dirt free cloth seat which are in like new condition. The chair fits neatly into the 20 inch wide by 26 inch high desk opening. 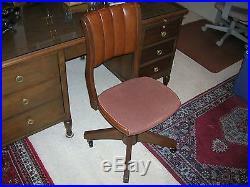 Please refer to the attached photos of both the desk and the chair. Only the Desk and the Chair are for sale. Any additional items pictured on or in the desk do not come with the desk and chair and are not for sale. 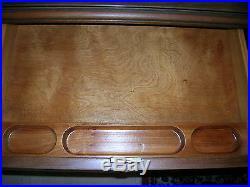 The desk itself is 30 inches in height, 34 inches in width and 60 inches in length. 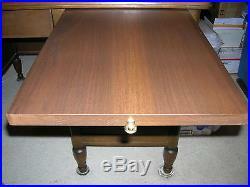 It is constructed of solid walnut with a laminate on laid top. 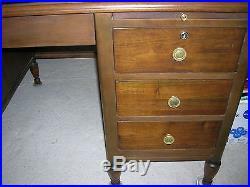 The desk has a center drawer with a fitted wooden pen/pencil holder. 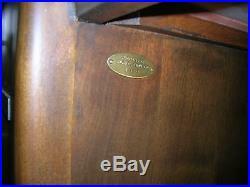 On the left side, there is an outward opening heavy door which reveals a pull out heavy duty credenza built to hold and easily conceal a wide heavy typewriter. 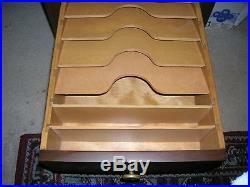 The three drawers on the right side are of equal 4.5 inch depth size, and all come with various wood separators for filing and organizational purposes. There is also a pull out board just above the top drawer on the right side to provide extra space for stacking files or writing. The pull out credenza and all drawers are in like new operational condition. 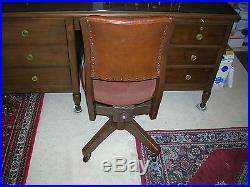 Both the desk and chair are solid, heavy, well made substantial pieces of furniture. There is nothing flimsy, rickety, fragile, worn or rotted about either of these pieces and both will be around for a long, long time to come. These pieces are in such excellent condition, that It is truly difficult to believe that both items are going to be 77 years old. 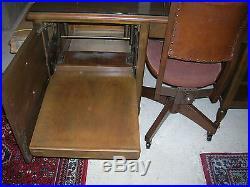 This Desk and Chair combo are pieces of American Business History! 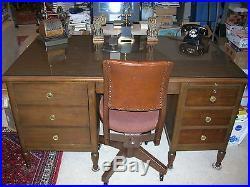 The item “Hughes Tool Company 1939 Vintage Antique Desk & Chair, Howard Hughes Doten-Dunton” is in sale since Friday, December 20, 2013. 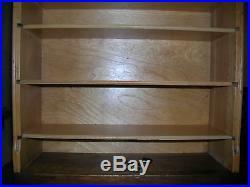 This item is in the category “Collectibles\Kitchen & Home\Furniture\Other Collectible Furniture”. The seller is “wumpas2020″ and is located in Golden, Colorado. This item can be shipped to United States.